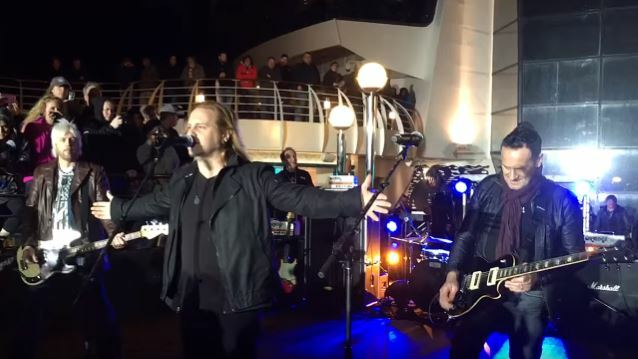 The surviving members of LAST IN LINE were joined by CINDERELLA bassist Eric Brittingham aboard DEF LEPPARD's inaugural "Hysteria On The High Seas" cruise to play a special set in memory of LAST IN LINE's bassist, Jimmy Bain, who died the previous night on the ship. Fan-filmed video footage of the performance can be seen below. Bain, along with drummer Vinny Appice and guitarist Vivian Campbell, was part of the original DIO lineup, which reunited in 2012 alongside singer Andrew Freeman to form LAST IN LINE. Bain died over the weekend at the age of 68. No cause of death has been revealed, although it has been reported that he was ill for some time. Campbell confirmed Bain's death, saying in a statement: "Jimmy's struggles with his demons were well documented through the years, but over the last 18 months, he had finally won that battle and he was bright and lucid and motivated throughout the writing and recording of the new record. He leaves behind him a rich legacy of work from RAINBOW, through WILD HORSES, DIO, and finally, LAST IN LINE. "Jimmy was immensely proud of our new album and his input to it was immeasurable. He was a very kind and gentle and generous soul and our lives were greatly enriched for having known him. We will continue to celebrate his life through his music." LAST IN LINE will release its debut album, "Heavy Crown", on February 19 via Frontiers Music Srl. The CD was recorded at a Southern California studio with producer Jeff Pilson, a veteran bassist who has played with DIO, FOREIGNER, DOKKEN and T&N, among others.